Just a quick recap, solar charger controller is an essential protective device for battery in an off-grid PV system and grid-connected systems with battery backup. (It's a more like our 2 yrs old's nanny while we are away from home.) It helps us to take good care of our deep cycle batteries by preventing it from overcharging. It does that by regulating the flow of electricity to the batteries. Here is a look at some of the best solar charge controllers available in the market today. 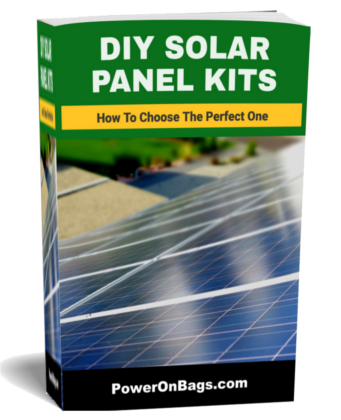 If you want to learn how to choose the best charge controller for solar panel system, check this charge controller selection guide here. We want you to pay attention to each of the power capacity, regulator types (Shunt, PWM, and MPPT), and ease of installation. Now take a deep breath and let's dive it. This Renogy 30A PWM controller is a ground controller, thus is able to effectively cope with any negative ground system. It charges in four main stages, Bulk, Boost, Float and Equalization. These stages are meant to protect the battery from overcharging, overloading, short circuiting and reverse polarity. Renogy also claims it can accordingly compensate for temperature changes by correcting charging and discharging parameters; in the long run, this prolong the battery’s life. This affordable controller comes with additional LED indicators to highlight its status. It supports Sealed, Gel and flooded batteries. Many Renogy's happy customers have praised it for being: suitable for small power needs, durable, well built with a sturdy enclosure and reliable to handle 30 Amps of current. ​4 Stage PWM charging (Bulk, Boost, Float, and Equalization) prevents batteries from over-charging and over-discharging. ​Compensates for temperature, automatically corrects charging and discharging parameters, and improves battery longevity. ​Remote Temperature Sensor compatible: measures the battery’s temperature and uses this data for accurate temperature compensation. Easy to install with good instructions. Durable with a sturdy enclosure. Device does not accept wire diameters large enough for a 30 Amp input. Data monitoring via PC is not available. This is a premium grade solar charge controller. It has a digital display that shows all the important system information and from the same place, you can make all adjustments. 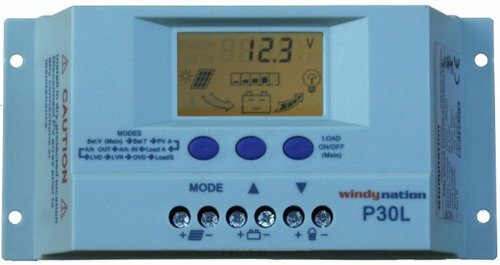 The WindyNation regulator protects the battery from overcharge and damage by the solar panel. It is suitable for use where system information is important like on rv’s, boats and tiny cabins among other off grid installations. Advanced electronic protection: overload, short circuit, and reverse polarity protected. ​LCD digital display provides system information (amp, voltage, temperature, load control). ​​Battery temperature sensor (BTS) is included. ​System settings are user adjustable by using the MODE and UP and DOWN buttons. Very high ratings and reviews. Can be configured for lead acid, gel or AGM battery types. LCD display has no back light. Requires a some mechanical or electrical aptitude to set up and install. Technical support is not very helpful. 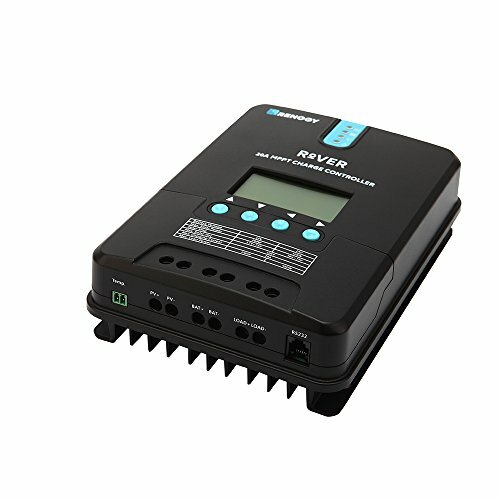 The Renogy Rover 20 Amp is one of the charge controllers of the Renogy Rover series. This controller features a smart tracking algorithm that maximizes the energy from your solar panels and efficiently charge your battery. Meanwhile, the low voltage disconnect function (LVD) will prevent your battery from over discharging. The Rover's charging process has been optimized for long battery life and improved system performance. The comprehensive self-diagnostics and electronic protection functions can prevent damage from installation mistakes or system faults. 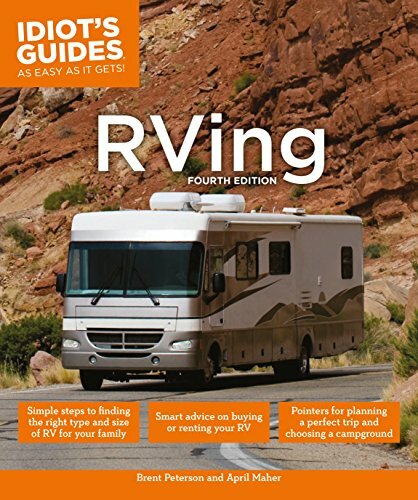 It has over 65% of 5 stars review on Amazon indicate a general liking of the product by most buyers. Though some buyer think that instructions are skimpy but after you installing it right, it works efficiently. Automatic detection of both 12V and 24V system voltages. Tracking efficiency up to 99% and peak conversion efficiency of 98%. Optional bluetooth module for remote data monitoring from smart phone. Not enough descriptive details in user manual. Connectors are very fragile, will break easily if over tightened . This Victron SmartSolar Charge Controller is able to harvest high amounts of power even in poorly lit conditions. It is equipped with built-in Bluetooth module which allow monitoring of your off-grid PV system with a touch of a smartphone. Device data such as solar panel power and the battery status can be accessed securely over-the-air. Furthermore, the free smartphone app enable you to set the battery charge algorithm, the timings and light deeming options too. Advanced Maximum-Power-Point-Detection in case of partial shading conditions. Intelligent Load output function prevents damage caused by running batteries 'flat'. Remote monitoring and control with built-in Bluetooth module. Sturdy and light-weight case makes it very portable and quick to set up anywhere. Terminal does not accept wire diameters larger than 10AWG. 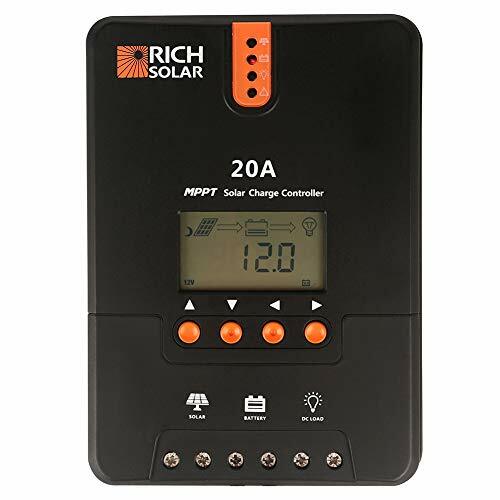 Last but not least, this Rich Solar MPPT charge controller features an advanced dual-peak tracking technology, when the solar panel is shadowed or part of the panel fails resulting in multiple peaks on the I-V curve, the controller is still able to accurately track the maximum power point. Like other MPPT controllers, it has a LCD screen that displays programmable charging parameters. With its advanced digital power supply technology, its rate of energy conversion is as high as 98%. Automatically detects 12V/24V DC system voltages. Peak Conversion efficiency of 98%. Charging data with storage of up to 1 year. 4-stage charging with MPPT output. Die-cast aluminum design for heat dissipation. Capacity is limited to 20A. Display has no back light. Your battery, panel and energy needs will play a big role in determining which type of charge controller will best work for you. Before you click the B-U-Y button, make sure you check the manufacturer’s manual to get the technical details of your solar power system and use this charge controller selection guide to pick the most ideal one. Not to forget, how much you are willing to spend is very important too. 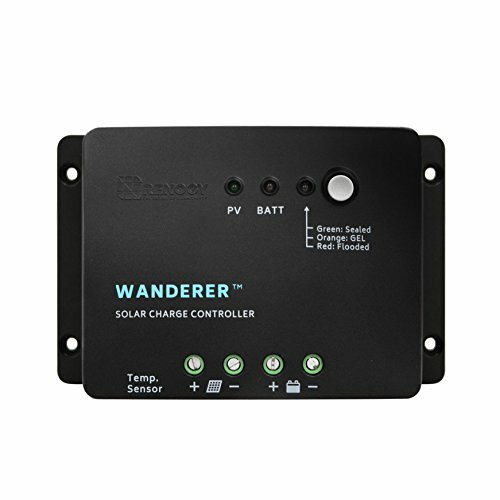 But if you require our opinion on this, we would recommend the Renogy-The-Wanderer PWM solar panel regulator if you have a small power needs and under a very tight budget. It is among our favorites for being not only affordable but also quite efficient. From the very many online product reviews, most buyers are satisfied with the very clear manual and durability. 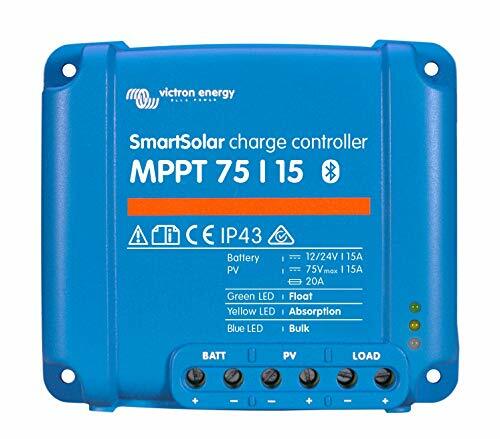 Another great choice would be the Victron SmartSolar MPPT charge controller. With their built-in Bluetooth module, you can enjoy the remote monitoring and control of its extensive features at your fingertips. As long as one does get to the near maximum voltage, all other features are excellent. If you have any questions regarding solar charge controller selection, please drop your questions in the comment box below or leave a comment on our social pages.